Robert P. Murphy points out that, not only does the post-scarcity economy portrayed in Star Trek not make sense, it's not really even post-scarcity. In reality, DeLong is wrong to think that the higher productivity of labor in agriculture and manufacturing somehow indicates a qualitative change in the nature of scarcity. Even though we enjoy a standard of living that, in many respects, exceeds that of Louis XIV, just about every American today desires more material goods. Indeed, many of DeLong’s colleagues recommend raising the minimum wage for precisely this reason — though I disagree with their recommended solution. He goes on to expose the flaw in equating moving beyond subsistence with eliminating scarcity. Indeed, scarcity occurs whenever the available resources are insufficient to satisfy all possible uses to which human agents could put them, meaning that choices must be made. There will be trade-offs, even in the world of Star Trek. Because of that, people would still need the institutions of private property and money, even if Gene Roddenberry banished them from the most enlightened and advanced species in his fictitious creation. Murphy cites an Original Series episode as an example of such trade-offs. For example, in “The Galileo Seven,” Spock must make difficult command decisions when the shuttlecraft is stranded on a planet. Yet, the suspense in the episode derives from Galactic High Commissioner Ferris bickering with Kirk over how long they should continue searching for the landing party while the plague-ridden people of Makus III await the medical supplies the Enterprise is delivering. 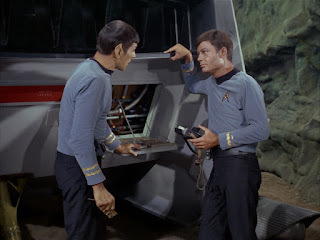 There is obvious conflict because of the trade-off involved: despite the wonderful ship at his command, Kirk (it seems) must choose between his stranded friend and the planet of sick strangers. I'm always intrigued by how much certain world-building conceits found in speculative fiction worlds reveal about their authors. In the case of Star Trek, we see how Gene Roddenberry's Campbellian optimism and more than a little wishful thinking informed his dream of a society where human ingenuity had done away with the messy realities like private property and free markets. But on closer inspection, not even Roddenberry's genius managed to consistently portray a world without trade-offs. As a refreshing counterpoint to Roddenberry's more naive vision, I prefer the science fiction of John C. Wright. His Count to Eschaton books are based on the premise that even galaxy-spanning civilizations capable of moving stars around still have to deal with the massive energy costs of interstellar travel. Far from socialist idealism, Wright's aliens are governed by the mercenary calculus of game theory. Bonus: a recurring theme of Wright's series is the main character's continual disappointment over the future's failure to turn out like the Star Trek-style cartoon he loved as a kid.